The Breeze Booster tm Port Ventilator provides an easy and efficient way to funnel air into side ports - often the only source of ventilation in back cabins, galleys and heads. It is perfect for all boats which have inward opening ports (side windows) as a source of ventilation. It can be mounted on most vertical ports from inside the cabin in a simple two-step process and requires no additional lines for support. The Breeze Booster tm Port Ventilator is made of durable flag stock nylon and PVC Frame with all parts assembled and ready to place on a boat. Can be used on inward opening side ports. Can face forward or aft depending on wind directions. Pops open and installs or folds for storage in seconds. Requires no line or halyards for support. #1 Grasp crossbar in one hand and securing rod in the other. (See Figure #1). Please note - both hands are under line. #2 Insert through window and apply slight tug to securing rod, this will cause the ventilator to pop open, then turn it to face the wind. (See Figure #2 and #3). 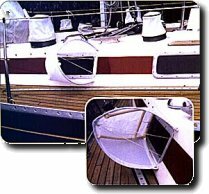 #3 Seat the ventilator against the side of the boat and pull vigorously on securing rod: bring it back through the window and wedge inside. (See Figures #4 and #5). Please note - quite a bit of pressure will be needed until it becomes "broken in". If the thickness of the cabin wall is unusually thick - cord length may need to be adjusted to achieve the shape as seen in Figure #6.